Sony plans to launch a head-mounted 3D visor in Japan, with dual OLED panels that are supposed to mimic the experience of watching 3D movies in a theater. Each display on Sony's HMZ Personal 3D Viewer has a resolution of 1280 by 720 pixels, with virtually no crosstalk between them, Sony claims. Together they offer the equivalent of a 62.5-foot screen viewed from about 60 feet away -- wider than most people's field of vision, SlashGear reports. The visor's headphones include 5.1-channel virtual surround sound. Sony isn't alone in this field: eMagin sells a 3D visor called the Z800, which also uses two OLED displays, and Vuzix recently announced the Wrap 1200, a pair of glasses with a 3D display inside. 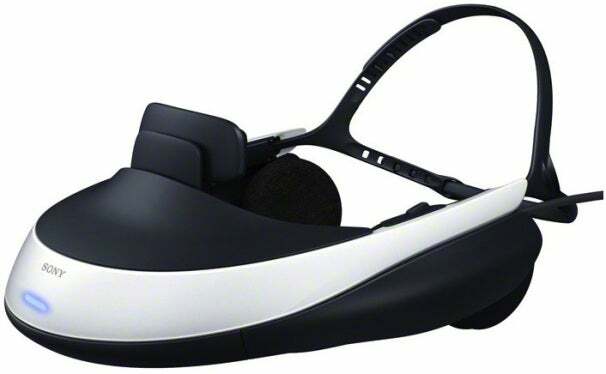 But Sony's visor offers a much larger and higher-resolution virtual screen than either of those headsets. It also supports the PlayStation 3 out of the box. And although viewing 3D content through a personal visor is a decidedly solitary experience, Sony's device includes an HDMI pass-through jack, allowing users to send whatever they're watching along to a television. I'm not mesmerized by 3D, but my interest is nonetheless piqued by the unabashed geekery of this contraption. I imagine playing 3D video games while lying on the couch -- a welcome break from the usual gamer stance of hunching forward -- freeing up the television for my wife. I'd look ridiculous. I imagine not caring. So maybe it's for the best that Sony hasn't announced any international release plans for the HMZ Personal 3D Viewer. It's launching in Japan on November 11. At the high price of 60,000 yen, or about $800, who needs that kind of temptation? This story, "Sony Unveils Head-Mounted 3D Display" was originally published by PCWorld.